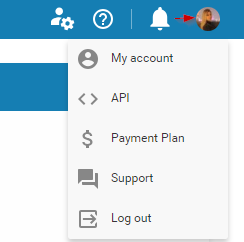 To subscribe for a Kanbanize account -> access your trial account and click on your avatar at the top right side of your board interface -> select Payment Plan from the menu. Note: Only users with "Account Owner" or "Make Payments" privileges have access to the Payment Panel in Kanbanize. Monthly (pay as you go) -> monthly subscription is paid only by credit card. Monthly (annual commitment) to get 10% discount -> monthly subscription is paid only by credit card. Annual (pre-paid) to get 20% discount -> annual subscription is paid either by credit card or bank transfer. (2) NUMBER OF USERS - our plans are based on different tiers of users with the lowest one being for up to 15 users. With the business rules, you can automate your process in achieving various scenarios. You can buy business rules in bulk packages, starting from 10 to 90 rules per account. * The set of powerful analytics data charts and graphs aims to help you identify bottlenecks and provide predictability of your workflows, so that you can make better data-driven decisions. * Secure access to Kanbanize with Two-Factor Authentication and Secure Single Sign-on. Note: The payment calculator instantly displays the amount of your payment based on the options you choose. Tax Notice: European companies with no VAT are subject to a 20% increase for taxes. Proceed further to the next step -> click on Next Payment Details to complete with the subscription process. Monthly plans (img.2): The monthly subscription can be paid by credit card only. The monthly plan will be automatically renewed and your credit card will be charged on the monthly due date. * Payment Notification Email - > please, provide an email where Invoices for all transactions will be delivered. 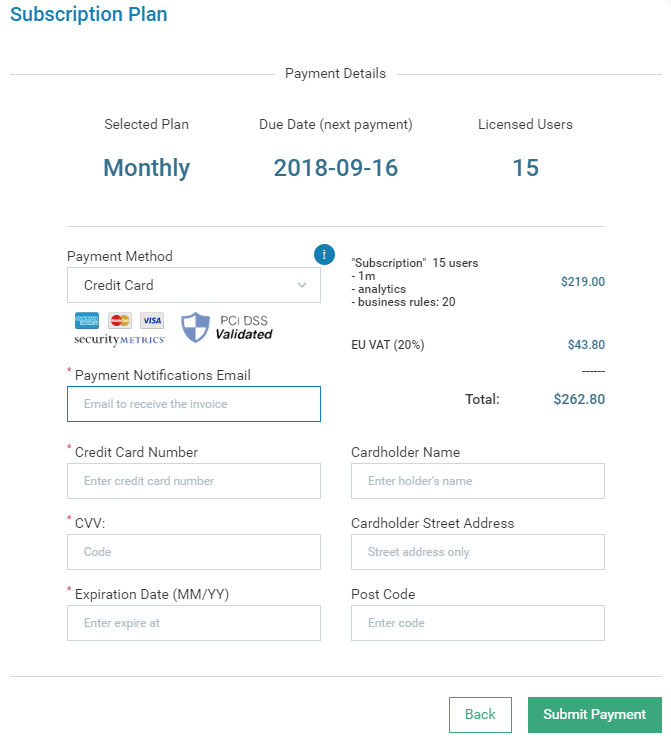 Fill in your Credit cards details and Submit Payment to complete the subscription process. 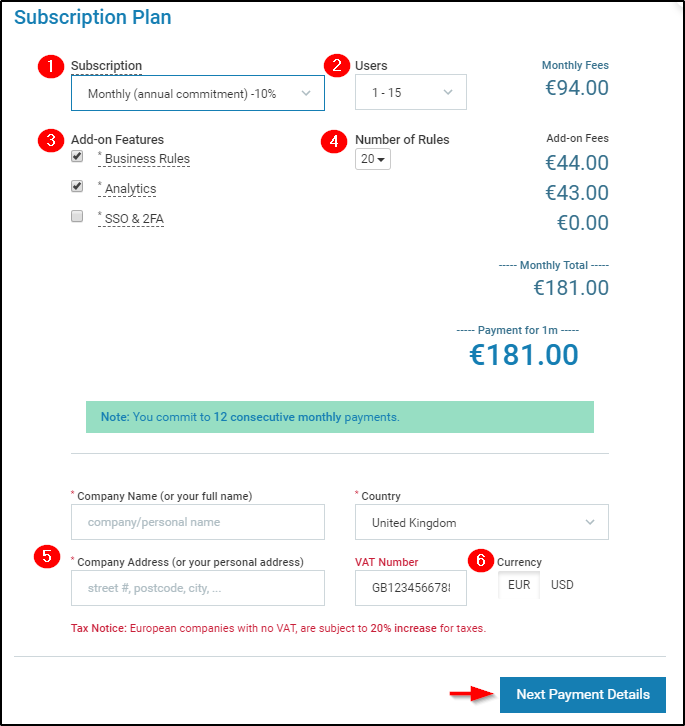 Annual Plans (img.3): with the annual subscription plan you have the option to select your payment method and pay either by credit card or bank transfer. Please, select your payment method from the respective field. - if you prefer to pay by credit card, please review the guidance associated with Image 2. * Payment Notification Email - > an email where Invoices for all transactions will be delivered. * Phone number in case we have to call you back. Purchase Order Number (this is optional) - PO to show on the Invoice. 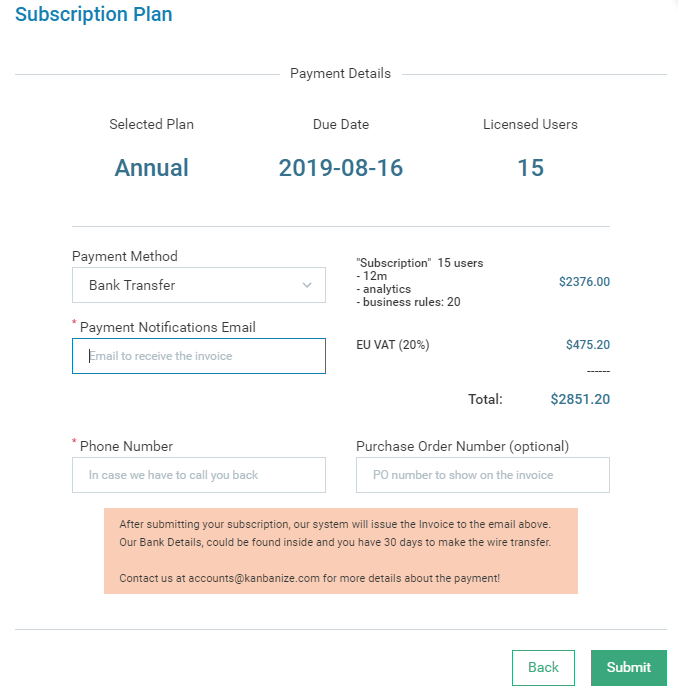 Click on Submit -> After submitting your subscription, our system will automatically issue an Invoice with the Kanbanize bank details and send it over to the provided Payment Notifications Email. You will have 30 days to make the bank transfer. Please, contact us at account@kanbanize.com if you have any additional questions about the payment process.